North Range Holiday Let click here or picture for further details. The Scots Mining Company House Trust is a registered Scottish Charity (SC013667) which holds the gardens of the House in Trust as a means by which the Designed Landscape, unchanged since William Adam laid it out in the 1740's can be maintained as a community resource for Leadhills, its environs and for the people of Scotland. Our project for 2011/12 is "The Secret Garden" our aim is to restore the original herb/medicinal garden a large area of the garden to the north of the bowling green, sheltered by the garden wall to the north and west and by steep banking to the south. This sheltered glade has numerous herbs and plants that have survived since they were first introduced in the mid 18th Century. We want to restore calm and order to this area of the grounds through encouraging the plants to re-establish themselves in the open rather than under thick undergrowth. Our aim is to save what is left of the original herb garden and turn the whole are in a sensory garden with full disabled access by installing ramps down into the "Secret Garden" glade where the aroma of herbs and fragrant plants will be able to be viewed and experienced and worked on by members of the Trust, villagers and visitors alike no matter what their abilities or level of mobility. There will be interpretation panels, raised beds and different textures under foot. A real cornucopia to stimulate the senses and to give access to all. If you wish to help us in our quest, come along any Saturday from 10am - 4pm where there will always be a warm welcome and a job waiting to be done. If you would like more information, don't hesitate to give us a call on: 01659 74235 or email me on: smch@leadhills.com we very much look forward to welcoming you. The last day of the season will be Saturday 29th of October when we will have our Halloween Party, come along and join in the fun. The Scots Mines Company's House and some of the men who lived there. "The Company's House is surrounded by trees and has a rich appearance which, I was informed by a villager he had never seen equalled". Joseph Fletcher. Reporter to the Children's Commission 1841. At the very top of the settlement when we have passed all the cottages, and "the Ha", and the potato patches, and the heaps of lead ore, we came to a place which takes all strangers by surprise: a charming house, embowered in trees, with honeysuckle hanging about its walls, flowers in its parterres, and a respectable kitchen-garden where the boast is that currants can be induced to ripen, and that apples have been known to form, and grow to a certain size, though not to ripen. This is the agent's house, and here are the offices of the Mining Company. The plantation is really wonderful, at such an elevation above the sea; and it is a refreshing sight to the stranger arriving from below. There may be seen, grwoing in a perfect thicket, beech, ash, mountain ash, elm, plane and larch, shading grass-plats and enclosed walks, so fresh and green that, on a hot day, one might fancy oneself in a meadow-garden, ner some ample river. In this abode there is a carriage and a servant in livery;-a great sight, no doubt, to the people, who can hardly have seen any other, except when sportsmen com to "the Ha", with all their apparatus of locomotion and of pleasure. In connexion with this abode is the office of the Company, where the books are preserved as far back as 1736. There may be seen specimens of the ores found in the valley; and among other curriosities, a small phial of water, about half-filled with gold from the Californian vein before-mentioned. In 1734 the Scots Mines Company built a house at Leadhills for their agent and manager, James Stirling. The house was deigned by William Adam, one of a family of architects, and whose great achievement is Hopetoun House. 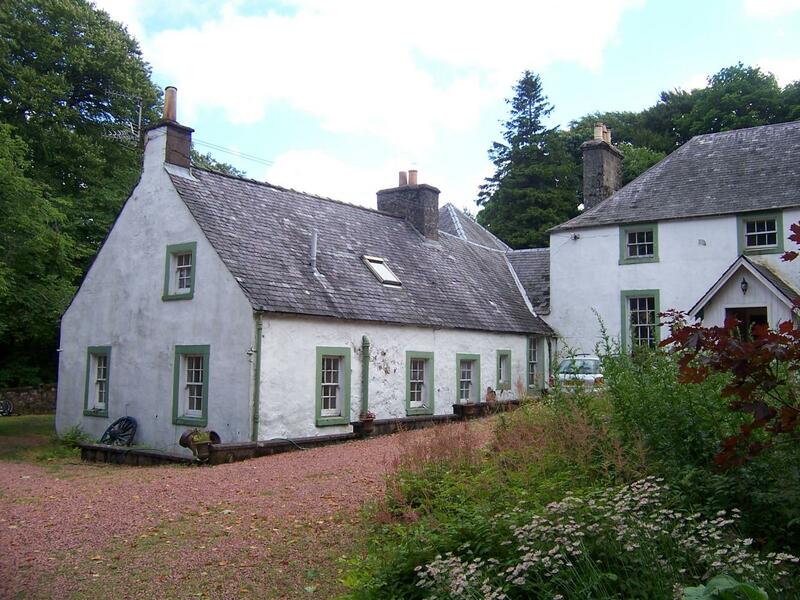 The house at Leadhills is probably the only surviving small house that William Adam built. The trees which visitors remarked on, were planted about 1740 and it was said that "each had first to be secured by three tethers" to keep it from being blown out of the ground. The wooded areas have never been altered or "improved"
A younger son of Archibald Stirling, a Jacobite who was imprisoned after the Brig o' Turk rising but later acquitted. By 1717 young Stirling was at Oxford and had established a reputation as a mathematician, but his Jacobite sympathies were against him and in 1719 he moved to Venice, from where he published a number of important papers, written in a scholar's Latin. Methodus Differentialis: sive Tractatus de Summatione..
1725 saw him back in London, and a confidant of Sir Issac Newton, but his politics prevented him obtaining the sort of position which his scholarship deserved. In 1734 he accepted the post of agent for the Scots Mines Company at Leadhills, an honourable and pleasant office in his own country. Besided a numerous set of friends, curiosity, and the desire of seeing a man of whom they had heard so much" induced many literary and scientific men to visit him. Stirling's wife died young leaving him with a daughter who married her cousin, Archibald Stirling, and he succeeded his uncle in 1770 as manager at Leadhills.